I’ve had a lot of requests to talk about IGTV and Instagram tips to help you grow your business. Well, IGTV is a new feature that Instagram launched in summer. At the time of the launch, everyone except smaller and new accounts were able to upload one-hour long videos on Instagram. However, this feature was released to everyone. Now, everybody has the option to use IGTV. You can use it either from your profile or the IGTV button which appears at the corner on the Instagram App. You can also download a totally separate app, IGTV App. It allows you to do everything that you can do in your actual Instagram or you can watch other people’s videos, whatever you want. I personally like to use it from my actual Instagram account. If I click on the IGTV button, it’ll open up my channel that I’ve created. If you have that button on your profile, the first thing it’ll ask you to do is create a channel which is super easy, quick and pretty straightforward. If you have any questions about that, feel free to let me know. I’m happy to answer them for you, but I think you could probably figure it out on your own. I use one of my favorite apps, Muses to increase engagement on my posts. If you haven’t downloaded it yet, you should. This App can help you to grow your business on Instagram overnight; I kid you not. IGTV lets you view your insights: the number of views, likes, and the average percentage of people who have watched your videos. If the percentage isn’t so great, say like 21%, it might mean that a lot of people dropped off at the beginning of your video, this usually happens with longer or boring videos. The trick may be to create shorter videos, improve their quality and ensure you add as much value as possible. These insights are great as they open your eyes to what interests your followers or viewers. What’s great about IGTV too is that you can add links to your IGTV stories. When adding a video on IGTV, you can click next, and from there you can edit your cover either by choosing the cover from your video or uploading your own cover photo, which I like to do using Word Swag. Word Swag cost about $299 to purchase; it’s totally worth it. I use it like every single day. You could upload something from Word Swag, put in a title, and then in the description section put any links of your choice. This is great for people who cannot use links on their Instagram stories because they do not have 10,000+ followers yet. I’m not sure why Instagram put that stipulation, it’s kind of annoying, but this is a workaround. You can use it in IGTV no matter what following you have. You can add as many links as you want and you can tag people and use hashtags too. I’m not sure what the hashtags are going to do at this point, but if you want to use them, you totally could. But just a few tips on how to make a horizontal photo into an Instagram story size. I like to use an app called Inshot. You can purchase the pro option which will give you the option to get rid of watermarks, which I’d recommend if you’re going to go this route. But if you click on videos and grab a horizontal one, head over to Inshot and resize it into different sizes. Here, go for 9 by 16 as that is the Instagram story size. From here you can zoom in or out, whatever you want to do. I can’t recommend Inshot enough for making horizontal images or videos into the right size for IGTV. 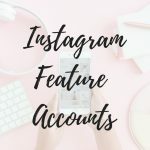 To sum it up ladies, please start using IGTV and Instagram tips to grow your business. Try some of the tips I have shared if you want to get the results I am talking about in this post. Also, feel free to reach out to me with any other question on IGTV or Instagram in general. Check out the Instagram Challenge as well. How can I upload a live video that I have previously done in Facebook into my IGTV ?